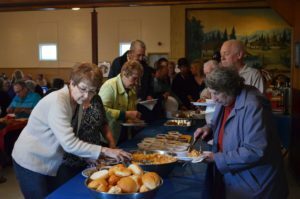 Sundown Ukrainian Orthodox Church will hold its 5th Annual Chili Supper and Auction on Friday, May 4, 2018. Our signature fundraiser supports the renovation and restoration of our Church, which was designated a heritage site in 2009. Our live auction includes about 30 items of broad appeal to bidders. In addition, we auction off our very popular gourmet pies and cheesecakes. Auction items range in value from $50 to $500. 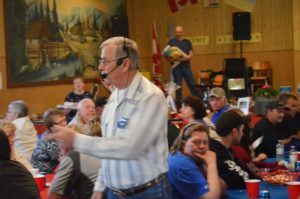 We are grateful to two of our local MLAs, auctioneer Cliff Graydon and Dennis Smook, for contributing their time to run the auction and encourage the bidding. Click here to see how much fun the event was in 2016. This evening has all the ingredients that guarantee a great time – delicious food, warm hospitality, and exciting action. We hope to see you there!